On Friday 8 November at 11 am Healesville Environment Watch activists will deliver a bill for $61m to VicForests on behalf of the people of Victoria. Please join these environmentalists if you can outside 473 Burke Street - VicForests offices. VicForests must this week pay Environment East Gippsland $630,000 in legal costs which it incurred defending its wrong action in planning to destroy wildlife habitat forest in Australia. This, and a pending case also mentioned in this article, is a welcome indication of independence in Victoria's judiciary, despite wide corruption of the democratic system in Victoria and the rest of Australia. VicForests are spending a lot of time in court and they still owe outstanding court costs to Environment East Gippsland. The environmental Davids who have been fighting these outstanding battles on our behalf are in need of our financial and political support. Today: Wednesday 10 November, 10am: Supreme Court prosecution of Brown Mountain protesters - be there! URGENT: Please lend your support by attending at Supreme Court to Victorian Government prosecution of Brown Mountain protesters. Wednesday at 10:00am, (10 November 2010) the Department of Sustainability and Environment will proceed with its prosecution of the individuals charged with protesting at Brown Mountain. meet outside the Magistrates’ Court at 9:15am, corner of Williams and Lonsdale Street Melbourne. A forest- lawyer will be there to meet you and direct you to the relevant Court room. This is a political cause of deepest importance. The Victorian Government and the ALP's involvement in forest crimes goes back years. The forest protesters are our bravest democratic and environmental activists. We must support them for all that they do for the rest of us. Read more about Today: Wednesday 10 November, 10am: Supreme Court prosecution of Brown Mountain protesters - be there! Fuel-reduction occurs on many occasions without being called that and often is not accounted for in bushfire inquiries. Nor is the impact on wildlife habitat, notably hollow trees. Senseless slaughter of Victoria's Old Growth..another Brumby legacy for Victoria. 29 April, 2009: Loggers have desperately chainsawed magnificent stands of ancient Australian Eucalypts along Bungywarr Creek in East Gippsland as woodchips, allowing our natural heritage to be sold out to the Japanese for a dispicable $2.50 per tonne! First blockaded in 1994, Old Growth at Bungywarr Creek has been targeted by loggers ever since. Premier John Brumby simply cannot be trusted with Victoria's natural heritage. Royal Commission demanded into VicForests logging arson of heritage old growth! I have to pinch myself to realise this is 2009 and not 1959. This photo just in from the old growth forests of Brown Mountain in East Gippsland - home of remnant giant Australian natives dating up to 600 years old. 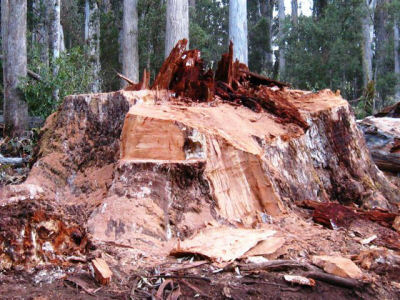 This photo depicts the Brown Mountain Massacre yesterday (22 April 2009) by VicForests on its celebrated World Forestry Day. Publicly funded yet publicly out of control, 'VicForests' has become emblematic for 'state-sanctioned slaughter and arson'. Brown Mountain - destruction complete! of 24 Apr 09. 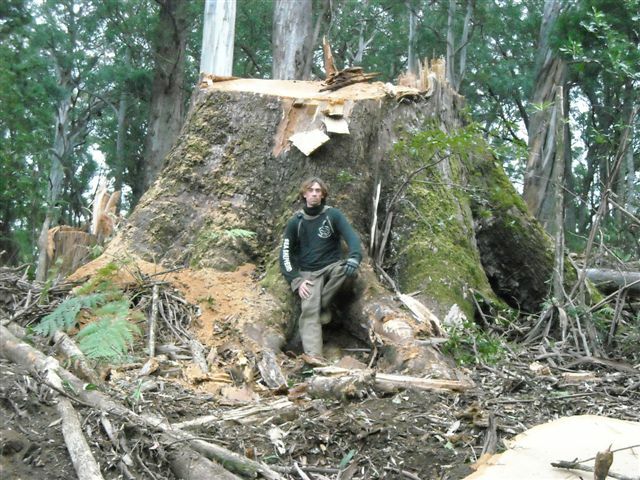 Read more about Royal Commission demanded into VicForests logging arson of heritage old growth! Out of the media frenzy to get ratings out of the Victorian bushfires, a 'so-called' bushfire expert on an ABC 730 Report panel (David Packham) advocated a 6 to 7 fold increase in prescribed burning for Victoria. See also: "Victorian bushfires by arson" of 26 Mar 09. The Australian Institute of Criminology reported last month that half of Australian bushfires are deliberately lit. Bushfire research needs to go further to evaluate whether in fact, of the most damaging, most are deliberately lit. The term 'fire bug' is too docile and to start seriously dealing with it, we must change the perception and the language. Bush arson has become so deadly and catastrophic a crime that it warrants the term 'pyroterrorism'.